As of January 1, 2015, enforcement is in effect for Phase 2 of the Alameda County Waste Management Authority (ACWMA) Mandatory Recycling Ordinance 2012-01, which requires all businesses, including restaurants, in participating cities to separate food scraps and compostable paper for organics collection. Phase 1 of the Ordinance began July 1, 2012, requiring recycling at businesses and institutions that generate 4 or more cubic yards of garbage per week. Phase 2 began July 1, 2014 and expands basic recycling requirements to all businesses, regardless of garbage service level, and adds new requirements for separating food scraps and compostable paper (“organics”) from garbage, particularly important for all food service businesses. Materials that must be placed in a separate organics collection container: Food scraps and compostable paper including food prep trimmings, spoiled or contaminated food, paper that is wet or contaminated with food or oils, waxed corrugated produce boxes, paper plates, towels and napkins. Materials that must be recycled: Cardboard, paper, recyclable glass food and beverage containers, metal (aluminum and steel) food and beverage containers, PET (#1) and HDPE (#2) plastic bottles. The ACWMA enforcement team is actively enforcing the Ordinance requirements through on-site inspections at all businesses and restaurants. Businesses found to be out of compliance will be given an official notice of the requirement to comply. Avoiding a fine is simple: keep recyclables and organics out of the garbage and keep garbage out of the recycling and organics. Free assistance and resources are available to help with compliance. To access free online resources including contact information for your service provider(s) to set up recycling and/or organics collection service, visit www.RecyclingRulesAC.org/cities-overview and click on your city. To request a free site visit to identify specific opportunities to reduce waste, comply with the law and often save money on solid waste bills, complete the online form at www.RecyclingRulesAC.org/request-assistance. 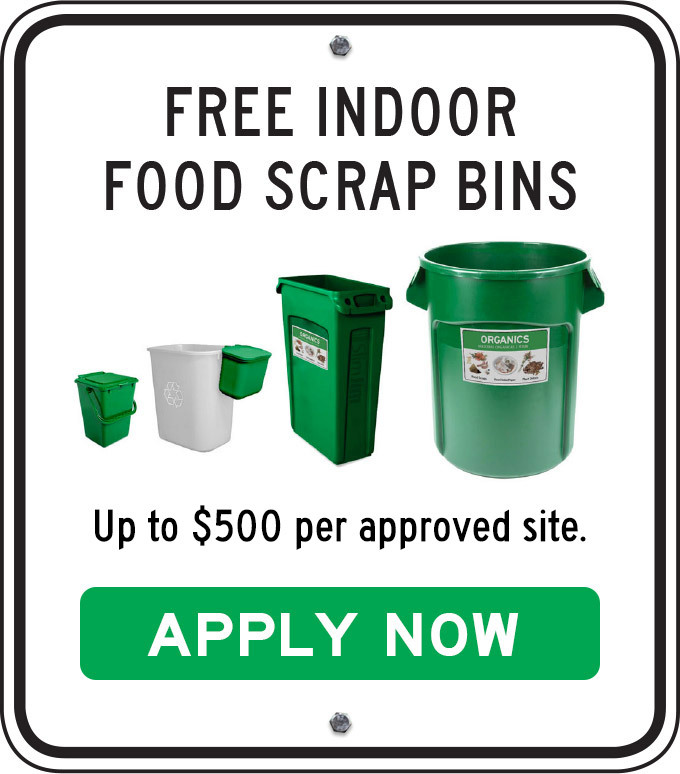 To help businesses comply with the organics collection requirement, ACWMA is offering free indoor food scraps bins. Up to $500 is available per approved business with a variety of containers and lids to choose from. Funding is limited. Apply online at www.RecyclingRulesAC.org/containers. Ordinance requirements differ by jurisdiction. Businesses and property managers are encouraged to check www.RecyclingRulesAC.org for details about their city’s requirements and how to comply. For more information, email info@RecyclingRulesAC.org or call the Ordinance Help Line at (510) 891-6575. To receive important updates, news and resources related to the recycling laws as they become available, sign up at www.RecyclingRulesAC.org/stay-informed. The purpose of the ordinance, which first took effect in July of 2012, is to reduce Alameda County’s waste stream and to help reach long-term waste reduction goals – specifically to ensure that less than 10 percent of the waste sent to landfills by 2020 is easily recyclable and compostable material.